– Rugby training will recommence on Tuesday 23rd April this term for all Year 7-12 rugby teams. All Year 7-12 players must find their own way to this training session, bus transportation will not be provided. Year 5&6 teams will not have a training session this week before the St Patrick’s trial. – Sat 27th April AIC Rugby & Football v SPC (full school trial). Please go to the ‘Weekly Fixture’ section to view all game times and venues. Note – the team lists are in draft only. We expect changes after the St Patrick’s trial and throughout the season based on player performance, attendance at training and attitude. Please notify the Sports Office if names are absent or names are misspelt. All students who play rugby from Years 5-12 must purchase the Villanova rugby uniform in readiness for the up-coming season. This includes shorts, jersey and socks. 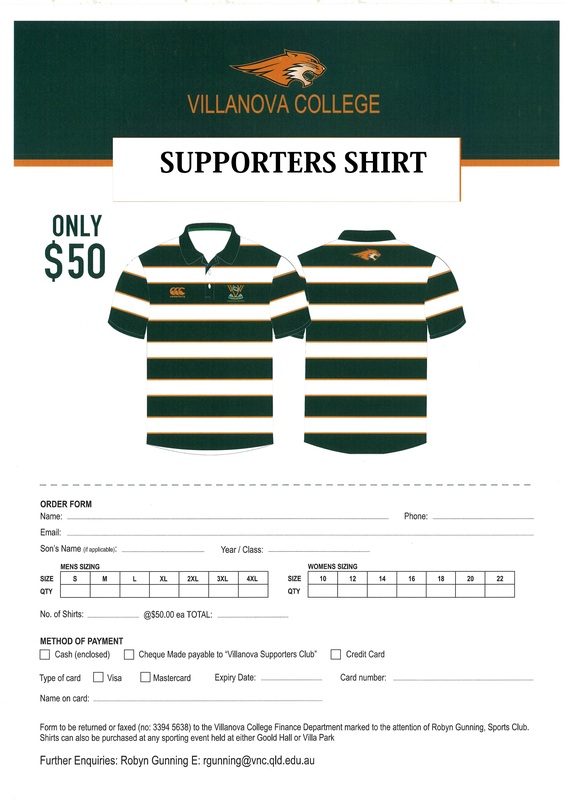 The Uniform Shop will have all rugby gear available for purchase. Please go to the ‘Weekly Fixture’ section to view all game times and venues. General information pertaining to all sports is found in the ‘Locker Room’. Rugby Union is open to all students at Villanova College during Term 2, with preseason trials and training held towards the end of Term 1 after the cricket and volleyball seasons. Our 1st XV and development squads commence training even earlier. Coaches consist of Villanova staff, parents and Old Boys. A number of highly qualified and experienced specialty coaches are also sourced from outside the Villanova community to provide advanced training to our players. All rugby training for the Year 5 and 6 teams is conducted at Little Langlands Park, which is located across the road from Villanova College. All teams from Year 7 to 12 train twice weekly after school at Villanova Park. The AIC Rugby Union season generally consists of seven regular games with at least two trial games. All AIC games are played on Saturdays, with home matches held at the Villanova Park playing fields in Tingalpa. The rugby uniform consists of a Villanova gold or green jersey, green or white rugby shorts, green and gold hooped socks, rugby boots, and a mouthguard, which is compulsory. Headgear and shoulder pads are optional. Items of clothing are available at the Uniform Shop and are not for hire. Each year, Villanova’s top rugby players are invited to partake in an exclusive rugby development program, which includes advanced strength, conditioning and skills sessions. The Andrew Slack Squad (1st XV) and Ben Mowen Squad (development squad), named after two former Villanova students and Wallabies players, form part of a pathway program for those wishing to play 1st XV rugby for the College. Every second year, the College organises a rugby tour to New Zealand for members of the Andrew Slack and Ben Mowen squads. Every alternate year, the players travel to Sydney to compete against our brother school, St Augustine’s College. Rugby at Villanova is supported by an active parents of players group who assist primarily with the canteen at home games and with organising the yearly tour. During the season, additional information such as training times, team lists, coaching staff, schedules and results are available on the College website. Andrew Slack commenced school at Villanova in Year 4 in 1964 and continued through to Year 12 in 1972 when he was elected College Captain. During his time at Villanova he represented the College in cricket, rugby and swimming. In 2010, Andrew was honoured for his contribution and achievements in rugby with his induction into the Wallaby Hall of Fame. Each year at Villanova, a number of coaches and other interested parties gather for a ‘selection meeting’ and choose 25-30 of Villanova’s highest performing 15- and 16-year-old rugby players for the subsequent year. These students are invited to form a squad to commence a rigorous preseason training program beginning the first week of Term 4 and continuing throughout Term 1 of the following year. The program includes intense development of strength and conditioning, speed and agility, and rugby skills to prepare students for the challenging season ahead. This advanced physical and mental preparation is necessary for students to play rugby safely and competitively at such a high and demanding level. It is an honour and privilege to be chosen as part of the Andrew Slack Squad, and it is expected that all members remain disciplined and committed to the rugby season from start to finish. Always giving 100 per cent, Andrew demonstrated his sublime rugby skills with a genuine sense of Augustinian humility. It is hoped that all members of the Andrew Slack Squad will be inspired not simply by his achievements, but also his character to give their all on and off the rugby field. Ben Mowen graduated from Villanova College in 2002, showcasing exemplary rugby skills and a passion that has helped him already achieve so much in his rugby career. During his time at Villanova, Ben was an all-round competitor in the sporting domain, representing the College in swimming, athletics and rugby. He starred in the 1st XV rugby team in 2000, 2001 and 2002, captaining the squad in his final year. He was also a model student, becoming a Villanova School Prefect and being named House Captain in 2002. He has carried his community spirit with him since school, working with numerous charities including the Starlight Children’s Foundation. Each year at Villanova, 30-40 talented rugby players who competed in the 12-, 13-, 14- and 15-years age groups are invited to join a development squad. It is expected that these players are strong probabilities to excel in the 13A, 14A, 15A or 16A rugby teams in the subsequent year, ultimately leading to positions in the Andrew Slack Squad and Villanova’s 1st XV team in the future. This development squad, named the ‘Ben Mowen Squad’, participates in the exclusive preseason program, which commences the first week of Term 4 and continues throughout Term 1 the following year. This program includes advanced training in strength and conditioning, speed and agility, and rugby skills. It is an honour and privilege to be part of the Ben Mowen Squad, named after a former Villanova student and current rugby player who always demonstrated a high level of discipline and commitment both on and off the rugby field. It is expected that all members will follow Ben’s example by working hard and dedicating themselves to be the best possible teammates and representatives of the College.